Jewelweed aka Touch-me-not, our native impatiens. This little herbaceous plant likes the damp. It can be found in ditches and at the edges of boggy areas where the soil is rich. Mostly greenery, it’s easily missed but it’s a wonderful discovery if you do stumble upon it. 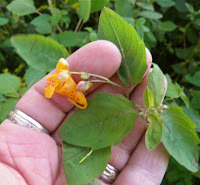 The flowers are yellow-orange and only about 1 inch long with a recurving tail like garden centre impatiens. They are borne on thin rod-like stems. Several flowers emerge from the same spot on the side branches and follow each other in bloom. They’re a jolly little flower with spots of deeper orange inside the throat and on the underside. The thinness of their stems mean they dance in the gentlest of breeze. The plant itself grows between 2-4 feet depending on location. 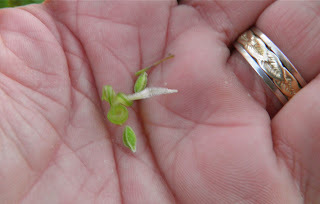 The bluish-green leaves have a pink margin and central vein, are about 2 inches long by 1 inch wide, and emerge along the stalk from small branchlets. These plants never grow alone and can be found in quite large colonies where growing conditions are right. 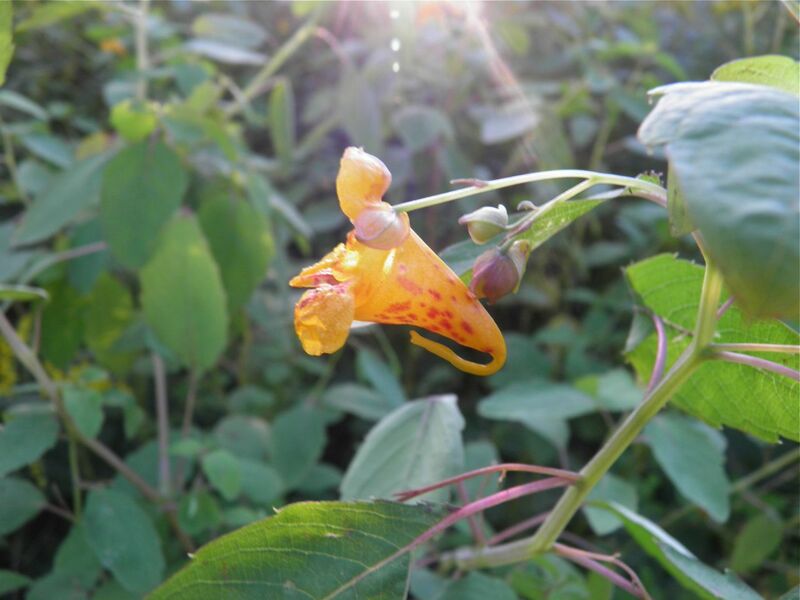 Jewelweed usually grows near water. It is also often found in areas where poison ivy grows (see poison ivy). The liquid from crushed jewelweed stems can be rubbed on skin contacted by poison ivy and symptoms will not appear or will be much less troublesome. Here’s the really interesting bit. 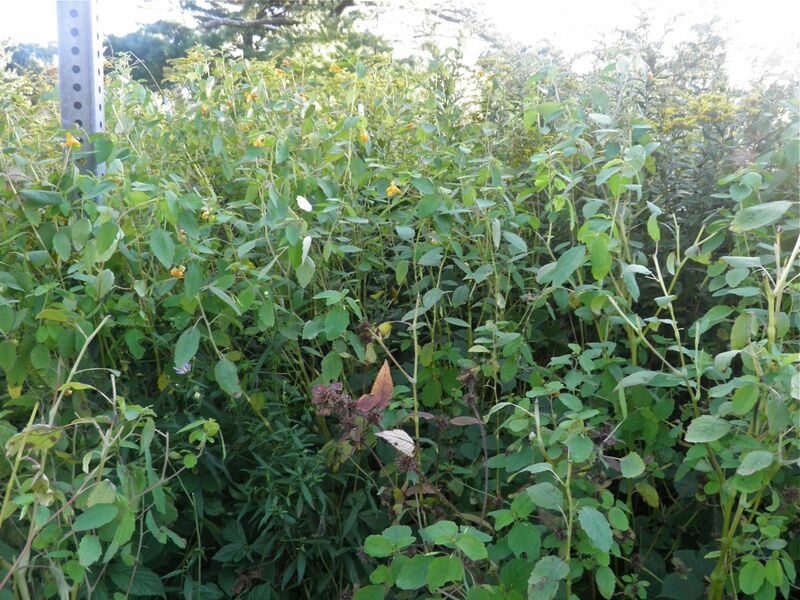 The seeds, contained in slender pods that can reach about 1.5 inches long, ripen in late August through September. They “auto-sow” themselves by means of a bio-mechanism that contracts in the heat and splits open the pod. What does this mean? At warmer temperatures the pods “pop” open and the seeds are flung far away from the plant. The fun part is that your hand has just enough heat to trigger the effect. Show this trick to a child and they’ll be fascinated. It’s even difficult to resist as an adult. Just place a pod in your hand and in a few seconds it will forcefully spring open. The trick is to get the pod off the plant and into your palm before it opens! I have seen a larger (I’m assuming cultivated) variant of this plant with soft pink flowers about twice the size of these little wild ones. They were in someone’s garden in Halifax. I’ve never seen them anywhere else. Being an impatiens, one would assume the flowers are edible but beware. 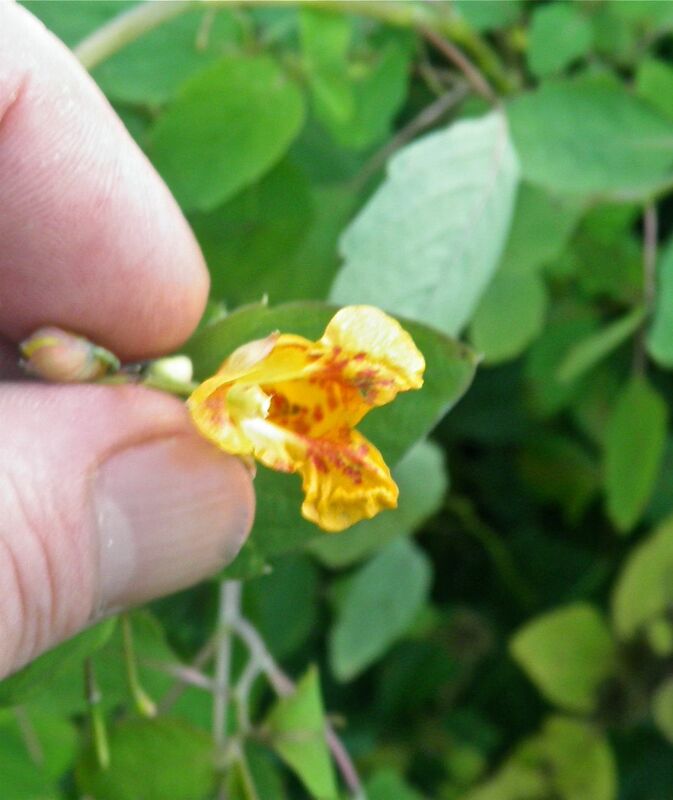 Most people know that you can add cultivated impatiens flowers to salads for an unusual peppery taste. Since these wild ones like ditches and bogs I would refrain from using them culinarily, for safety sake. Our ditches tend to be less than sterile here, and I’m sure it’s a similar situation in other places. Regardless, these flowers are fun to enjoy on strolls in the latest days of summer. Stop and have some fun with the seeds. Watching the pods pop open in your hand can be addictive! I’ve never tried to bring these plants from the wild to my garden but I assume if you have a moist spot there would be no reason why you couldn’t. 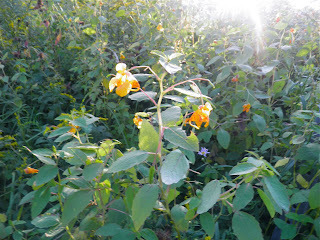 I have seen them growing in both fairly deep shade and full sun. I would imagine success would hinge on the soil. I’m not quite sure what “ditch soil” is composed of, but I would imagine it’s fairly high in organic matter. If I have the chance to collect some seed, I may actually try some in my side border for next year. Nothing ventured, nothing gained!